- door neighbor and those that introduce us to confront stereotypes and own neighbors, but also for ways of cooperating with Balkan neighbors by craft and design in the process of creating an object is to the origin. Maps, questions and discoveries from Campulung (Romania), Hydra (Greece) and Veliko Tarnovo (Bulgaria) will be documented and presented as evidence of a project pioneer signaling the cultural richness of each of these three places, in the context of similarities and differences between them in the Balkans, but also opportunities for collaboration. 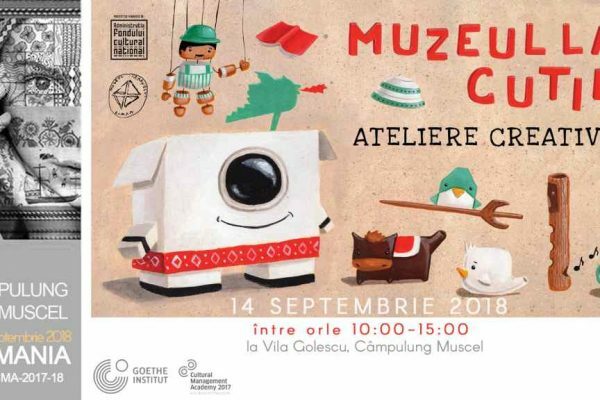 10: 00-15: 00 - MUSEUM IN BOX - Workshop for children at Villa Golescu. 16: 30-19: 30 - afternoon in the courtyard of the Villa Golescu crafts. 20: 00-22: 00 - FILM NIGHT IN THE CITY 1 short films dedicated to children, in collaboration with Animest. 10: 00-13: 00 - cultural adventure - "Tracking Berechet architect". 13: 00-15: 00 - Presentation and tasting at Villa Golescu. 20: 00-22: 00 - FILM NIGHT IN THE CITY 2 short film "Splendida accidental death" and feature film "Titanic Waltz". 17: 00-19: 00 - EXHIBITION support short film "Splendida accidental death." 20: 00-22: 00 - FILM NIGHT IN THE CITY 3 film Balkan surprise. Research Foundation Pro Patrimonio, within a radius of about 50 km around the Villa Golescu revealed a map of 45 craftsmen. 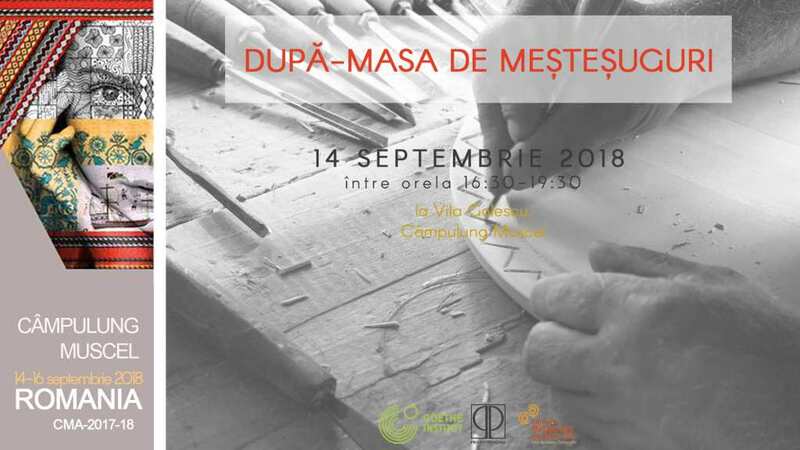 We can not, unfortunately, bring them all together to know them, but we want to make it possible to find and direct interaction with stories, tools, materials and craft them through an event workshop right in court Villa Golescu of from Campulung. We invite you therefore to an afternoon interactive, creative and full of craft with four craftsmen loved the Pro Patrimonio Foundation to discover and work with them in different processing techniques and modeling of wood and stone for weave and sew. We'll see how it arose collection objects Honest GoodsWe talk to a designer in Bulgaria on the crossroads of two cultures in the process of achieving an object and have the opportunity to build your own object under the guidance of specialists. 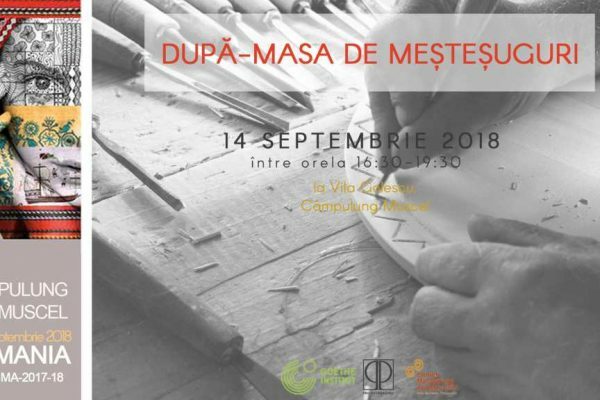 Event Workshop will be held Friday, September 14th, 2018, at 16:30 in the courtyard of the Villa Golescu Str. Soldat Golescu nr. 3 city Campulung, Arges. Both children are expected - preferably more than seven years - and adults. Entries are made online, subject to availability, filling this form. There is no entry fee, but a donation is welcome any spot. Unexpected pockets of the city can turn on overnight spaces for temporary events and creative installations. Pro Patrimonio Foundation explores and tested for three days mark the current parking, former cultural area of ​​the city (summer theater), as an area of ​​open-air cinema. 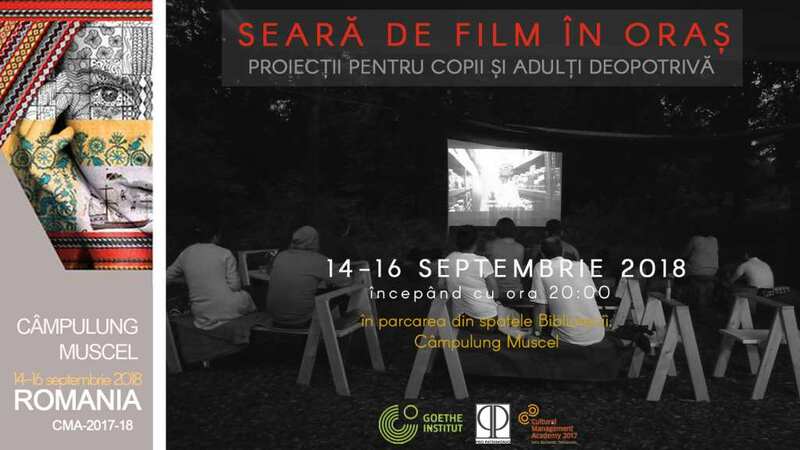 The first movie night will begin Friday, September 14th, at 20:00, with a selection of 19 short films Animest dedicated to children who are part of the "Museum in a Box" - a project co-funded by the National Cultural Fund Administration and run by the Museum of the Romanian Peasant. "Paper Polymals" / "Animals Paper" (Germany, 2016, 3'54), dir. Waldemar Schmidt. “She’s Got the Blush” /”Lotte e timidă” (Belgia, 2016, 5’15), dir. Els Decaluwe. "The Flying Boy" / "Fly Boy" (Russia, 2014, 6'24), dir. Eugenia Zhirkov. "Piccolo Concerto" (Germany, 2016, 6`), dir. Ceylan Beyoglu. "Tower" / "tower" (Lithuania 2014, 8'00), dir. Janis Cimmermanis. "Prince Ki-Ki-Do The Swamp Monster" / "Prince Ki-Ki-Do and swamp monster" (Slovenia, 2014, 4'10), dir. Grega Mastnak. "Please frog, just one sip" / "Please, frog, even a drop" (South Africa, 2016 9`55), dir. Diek Grobler. "Hey Deer" (Ungaria, 2015, 6`17), dir. Bárczy Ors. "SuperBot - Magnifying Mess A" / "SuperBot - it is higher under a magnifying glass" (Argentina, 2013, 3'17), r. Pablo Alberto Díaz Gervasio Rodriguez Traverso. "Balloona Laguna" (Germany, 2014, 6'35), r. Matisse Gonzalez. "Ridiculous Wishes" / "The Three Wishes" (Russia, 2015, 7'21), dir. Ekaterina Savina. "Leviathan and the Fox" / "Leviathan and the Fox" (Czech Republic, 2015, 7'12), dir. Lenka Božoňová. "Let's Play Story: The Ant and the Grasshopper" / "Let's play of the grasshopper and the ant" (Croatia, 2015, 6'37), dir. Marina Andree Skop. "Dinosaurs: Terrible Lizards" / "Dinosaurs, lizards fierce" (UK, 2014, 4'40), dir. Joel Veitch, Alex Mallinson. "Anatole's Little saucepan" / "pan Anatole" (France, 2014, 5'47), dir. Eric Montchaude. "Song of the Lark" / "Song of the Lark" (Belarus, 2014, 6'57) d. Tatiana Kublitskaja. "Tulkou" (Franţa, 2013, 11'00), r. Sami Guellaaï, Mohamed Fadera. "The Brave Mother" / "the courageous mother" (Russia, 2014, 5'37) d. Alexandra Lukina. "Hypnagogic hallucination" / "hypnagogic hallucination" (Belgium, 2013, 6'30), r. Group (13 patients). The film, inspired life painter Medi Dinu life that crossed the twentieth century, is an evocation of historical moments and cultural figures who peopled life painter. Personalities such as Ion Barbu, Nae Ionescu, avant-garde group are mentioned in the film a poetic journey. Nicoara Ioana Sergiu Negulici and writers will join us for more stories. The evening continues with a classic film, directed by Paul Calinescu play by Tudor Muşatescu, a milestone in Romanian cinema, especially for city dwellers due to shots to the Câmpulung "Titanic Waltz" (1:30 '). Last evening is dedicated to sharing cultural heritage and will have a surprise film of neighbors Bulgaria and Greece. Film series dedicated to both children and adults, will run from September 14 to 16, 2018, starting at 20:00. 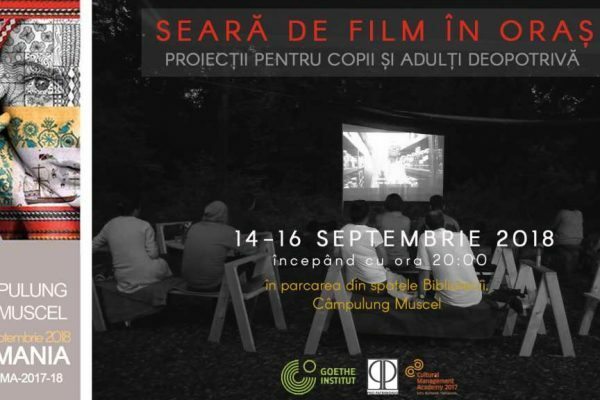 Open-air cinema will be installed in the center of the parking lot next to the Municipal Library "Ion Barbu". Events do not require a registration form in advance, we look so directly at the scene. There is no entry fee, but a donation is welcome any spot. 3.Aventura cultural - "Tracking architect Berechet"
Team exercises and sample observation, attention, patience, guidance, creativity and inventiveness it expects even challenge all young and they want to join a true cultural adventure type treasure hunt in the city. 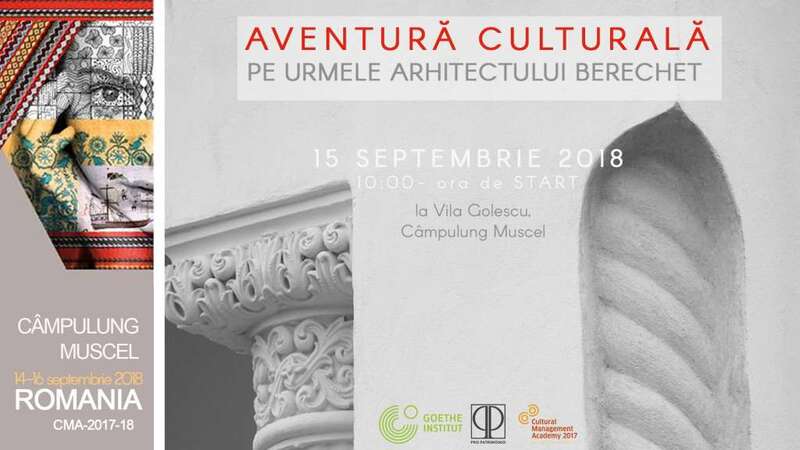 Route and cultural adventure will start Saturday, September 15th, from 10:00 in the courtyard of the Villa Golescu Str. Soldat Golescu nr. 3 city Campulung, Arges. The route will take approximately three hours and will end with a festive surprise in court Villa Golescu. They are invited to participate both children and adults. Teams will be made on the spot. Entries are made online, subject to availability, here . 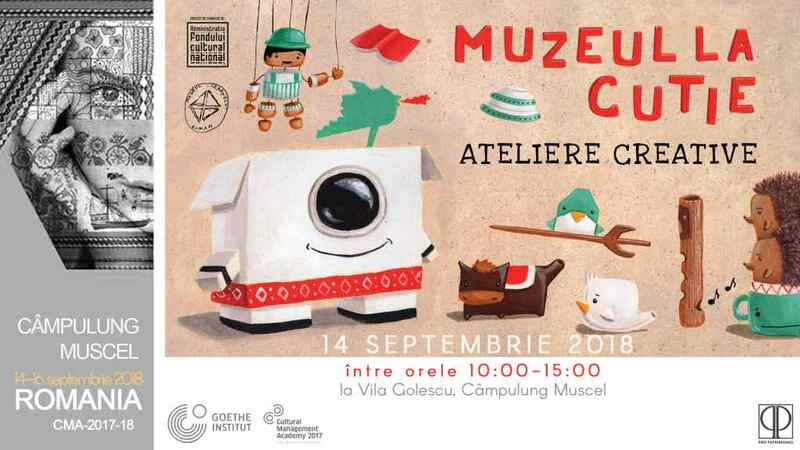 4.Muzeul the box - Workshop for children at Villa Golescu. Director, film, action! Pro Patrimonio Foundation in partnership with the Romanian Peasant Museum, the Villa Golescu waiting for a unique workshop staging of stories. The workshop is part of a larger project to promote intangible heritage, "Museum in a Box" and proposes ingredients ideal for adventure creative and playful: selection and adaptation of a story, the characters and choice of appropriate techniques for building characters - patchwork, gluing, sewing or wire, establishing frameworks scenography and their construction. Events in Campulung, between 14 to 16 September 2018, part of the "3 Doors, 3 Countries"- a project coordinated by Pro Patrimonio Foundation, in partnership with Greece and Bulgaria, supported by the Goethe Institute and Cultural Management Academy. In this project, three different teams will document and present the cultural wealth of three cities (Hydra - Greece, Veliko Tarnovo - Bulgaria and Campulung - Romania) in the context of the similarities and differences between them in the Balkans, but also opportunities for collaboration . In Hydra, Festival Miaouleia team in Greece the project "3 Doors, 3 Countries” a organizat, sâmbătă, 16 iunie 2018, conferința “Managementul și promovarea patrimoniului cultural tangibil și intangibil al unui loc” la Muzeul de Istorie – Arhiva Hydra. Conferință s-a axat pe rolul patrimoniului cultural în promovarea orașelor. 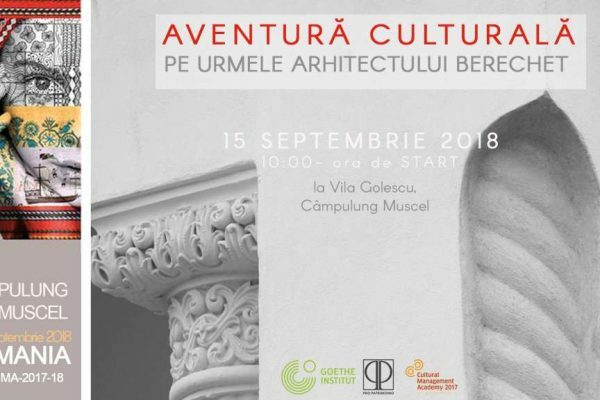 Scopul conferinței a fost acela de a evidenția rolul rețelelor culturale în dezvoltarea regională și turism, importanța inițiativelor locale și a colaborărilor internaționale în promovarea unui sit prin dezvoltarea permanentă de noi produse și servicii culturale. During the conference were presented and project actions that occurred: photo competition as a reason to start dialogue about local cultural heritage and its relation with Balkan context; mapping "Hidden Hydra"And printed material offered for use by locals and visitors; open to the public during an art exhibition, a lighthouse in Aggelochori, Thessaloniki examples of good practice in relation to our heritage common Balkan. Bulgarian team prepares the project "3 Doors 3 Countries” la Veliko Turnovo, în perioada 12 – 14 noiembrie 2018. Organizația VT Events și TAM – un spațiu pentru inițiativele culturale și sociale – creează o hartă a orașului care va include locații interesante, interconectate pe rute speciale. Prezentarea hărții va include și o dezbatere despre conservarea și exploatarea patrimoniului cultural al orașului, precum și exemple de bune practici din România și Grecia. Activitățile vor include, de asemenea, artă contemporană în spațiile publice, schimbul de tineret între România și Bulgaria și un atelier de lucru, de o săptămână, între meșteri locali și un designer român. We hope that the events of the Pro Patrimonio Foundation in Campulung will "open doors" in the local community by providing cultural tradition of this city in an international context and especially in the Balkan context. Organized by the Foundation Pro Patrimonio. Supported by: Goethe Institute and the Cultural Management Academy. "Museum in a Box": Cultural project co-funded by the National Cultural Fund Administration and run by the Museum of the Romanian Peasant. The project does not necessarily represent the position of the National Cultural Fund Administration. AFCN is not responsible for the content of the project or how project results can be used. These are entirely the responsibility of the financing.